Could Neanderthals have had more complex speech than we thought before? The challenge: Unlike pottery shards, arrowhead flints, and cave paintings, language does not leave an archaeological trace that can be uncovered by intrepid linguists bearing bullwhips. That makes anything we say about early human speech and language very speculative. (As I’ve mentioned elsewhere, e.g., How did languages evolve?, it’s been deemed so speculative that at one point, the Paris Linguistics Society banned discussion on the topic in the 19th century.) And that makes what we say about Neanderthal speech doubly speculative because at least with humans, when we consider the evolution of speech for anatomically modern humans, we have living, breathing examples to look at, measure, experiment on, and observe. Everything about Neanderthals, we have to reconstruct from fossils and, now, DNA. That hasn’t stopped a lot of recent research on the subject, perhaps inspired by new DNA evidence. I’ll outline the two general viewpoints: Arguments for simple, primate-like language: The general consensus among the old guard linguistic establishment (e.g., Chomsky, Bickerton, Phil Lieberman—I’m mixing together some disparate views here) goes a little something like this: 1) Argument from vocal anatomy: Neanderthals lacked the descended larynx characteristic of modern human anatomy. A descended larynx creates room in the mouth for a far greater amount of different sounds that can be made. More sounds means more possible words. More words means more word combinations. This means syntax, a system for combining words together beyond just two/three word phrases. 2) Argument from general anatomy: It is generally assumed, from head shape and overall anatomy that Neanderthals were strong, dumb brutes. Without a significant enough cranial capacity, particularly in the frontal lobe, which really distinguishes humans from non-human primates, there is no way they had anything other than basic vocal calls. 3) Argument from archeology: Neanderthals did not leave behind any significant cultural artifacts, like cave paintings and arrowheads suggestive of higher level cognitive capacities like abstract representation (cave paintings) or hierarchical planning (arrowheads) that are argued to go hand in hand with human language. 4) Argument from genetics: It is generally assumed that Neanderthals had very different genetics than us and are basically a different species. Therefore, they must have a very different language system. Since human language is unique in certain ways (Noam Chomsky has said that human language is unique in the biological world. Is he correct?) and more complex than any other animal communication system in a lot of ways, it’s unlikely that a completely different species had a similarly complex system of communication given the evidence above. You take that story to a linguistics cocktail party and you certainly won’t be laughed out the door for yer ign’ant ways. Indeed, that was the general consensus when I started grad school. But there was a certain uneasiness about the argument. Essentially, it’s a argument from a lack of evidence—we don’t have evidence that Neanderthals had anything more complex than primate speech so we assume that they didn’t. (And primate speech can get pretty complex, e.g., great ape language, though it’s not clear how complex it’d get without humans teaching them). So basically, it leaves open the possibility that Neanderthal speech was far more complex, if only someone would uncover some evidence. An alternate view: It comes from respected researcher, Stephen C. Levinson (one of my academic idols). He’s been arguing, for a while, that the Chomskyan orthodoxy is wrong. That recursion (In what sense is the term “recursion” used in linguistics?) is not the silver-bullet distinguishing feature of human language. That human language evolved gradually. That human language is different from other animal languages in degree, not kind. That we won’t find a language gene that explains it all. That there isn’t a language organ that is anatomically and functionally distinct from our general cognitive system. In a recent open-access paper with Dan Dediu, “On the antiquity of language: the reinterpretation of Neanderthal linguistic capacities and its consequences,” they argue that human language is a lot older than the 100,000 to 200,000 years that has been generally assumed and that Neanderthal language was far more intricate than we give them credit for. Included in this shared genetic profile is a gene associated with language, FOXP2. I’m skeptical of this meaning particularly much - it’s not clear how FOXp2 is implicated in human speech - but it’s part of the puzzle. 2) Similar Ontogeny: Humans are notable for undergoing significant development—cognitive and physiological—after birth. This has significant implications for social structure as well as for language development, which has a long developmental trajectory of 7+ years and requires significant brain post-partum brain plasticity. Turns out Neanderthals may also have a similar ontogentic trajectory, suggesting similar brain development and social structures that could support more complex language. 3) Similar Speech Apparatus: An interesting property of humans, related to language, is that the speech production and auditory systems a closely linked. There are neural projections from the production system to the perception system absent from all other primates (and only present in certain songbirds that learn their songs). And the perceptual system is tuned to an acoustic range characteristic of speech (1-3kHz) unlike other primate where there is greater relative sensitivity to environmental sounds. Recent analyses of the Neanderthal ear suggests a similar sensitivity to vocal-tract ranges of sound. On the production side, some are now claiming the descended larynx is overly emphasized as being crucial for producing a wide range of speech sounds; that general oral motor and pulmonary control are more important. Neanderthals have this control. 4) Neanderthal Culture: Finally, there is growing evidence that Neanderthals did have a more complex culture than assumed. They buried their dead, had complex stone tools requiring hierarchical planning (e.g., organization of 50 steps to get final product), cooked, and possibly made shoes. There is also evidence that they used pigments for certain things. So, there does seem to be evidence that Neanderthals were not the dumb brutes we once thought. New genetic and archaeological evidence suggests that they may have had the capacity for language at a level of complexity far closer to humans than to other primates. Capacity doesn’t mean actuality, though, and much like our hypotheses on how human language evolved, much of what is argued are educated guesses, at best. So for now, the answer isn’t clear, and hopefully future advancements in genetics and archaeology will fill in more and more of the pieces of this puzzle. Would a pure Neanderthal, if one were still alive, be considered a person? 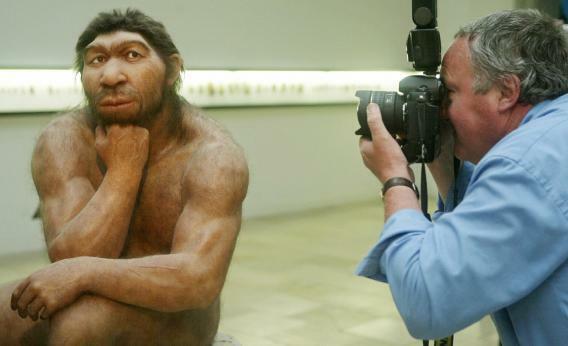 How credible is it that humans mated with Neanderthals? How can some asians/indians be 3-4 percent neanderthals, when neanderthals only lived in Europe?